One of the main reasons that I made the "My Life" short films was because I had travelled on the public bus service for a total of 22 years. I travelled to the Riddrie Centre, Growing Concern and also attended my gardening project funded by Glasgow City Council. I went to ADTEC, a computer training project that was based in Castlemilk and attended the Silver Birch (Scotland) Ltd, a horticultural project in Milton of Campsie. I travelled from Easterhouse to Parkhead Forge every day to meet the Silver Birch mini-bus. The so-called "normal people" who travel on public transport are often school kids who give me a hard time. They make fun of my disability, calling me a "Mongol", a "Spastic" and other upsetting names. In March 2008 three girls came on the number 46 Firstbus from Parkhead to Easterhouse at Shettleston Road, one of the girls called me all the names under the sun, she then pushed me up against one of the windows and her two friends thought it was a great laugh. I phoned and wrote a letter to the school in question and got a reply which was not very helpful, so I phoned my local councillor Grant Thoms. After the incident on the bus I was sick. I closed myself away in my house for four weeks. I did not go to Silver Birch or my All Write Writers Group or my swimming club which meets at the Whitehill Pool. I was going to give up my fundraising and organising work with the Glasgow Taxis Outing Fund and also cancel my Lourdes trip. As I say in the film, I just take it; I don't say anything at the time in case the people have a knife or something on them, but I didn't give up. I took the chance to make these short films when it came along. 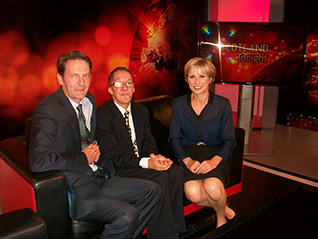 If I had given up, those who make fun of people with a learning disability would have won. So I went back to doing the things I enjoy. These films present the audience with an insight into a problem which my friends and I encounter on an almost daily basis. If others can begin to understand the difficulties we face and how we try to deal with them, life can be better for everyone in the community. Had I not gone back to Silver Birch I woud have missed all the friends that I had made. From the Client Manager Shirley Craig, Business Development Manager Mark McCrorie, to staff members; Eileen Campbell, Joe McGroarty, Peter Wallace, Stuart Johnson, Hazel Yeo, Mark Williams, Lorna Stewart, Fiona Callaghan Duncan Blair and Lynn Barclay. I help to run the sales area at the Silver Birch. I sell plants, mushroom-compost, ornamental bark and multi-purpose compost. I also water the plants, keep them weed free and looking nice. In addition, I help in the canteen area by making the teas and coffees and a hot dish for clients and staff. 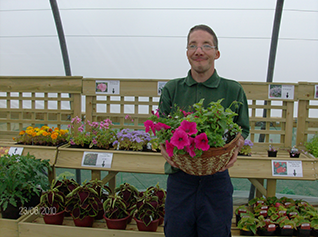 In June 2012 I completed my SVQ in Horticulture at Langside College. I have been going on the annual Taxis Outing since I was three years old. Now I am an honorary committee member of the Glasgow Taxis Outing Fund. I help out behind the scenes and at fund raisers. I assist with the organising of the outing to Troon each year. 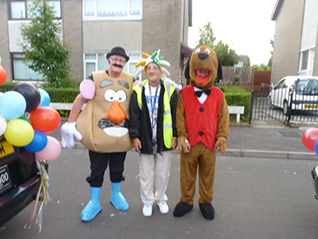 In 2013, I raised a total of two thousand pounds for the benefit of the kids for the 68th annual Glasgow Taxis Outing, which took place on Wednesday 19 June 2013. It was a great day and the weather was sunny so all the kids had a great time. In addition to the My Life films I have helped to make a documentary about the Taxis Outing called The Invasion of Troon.